Tascam has introduced the Model 24 digital multitrack recorder, which offers 24 tracks of 24-bit, 48 kHz audio capture (22 channels and a stereo main mix) and 22 playback tracks via either USB 2.0 or to the unit’s onboard SD Card recorder. Tascam said the SD Card recorder offers one-touch recording and includes transport controls, auto and manual punch in/out and overdub capability. With color-coded knobs, faux-wood sides and a retro design, the Model 24 is based on Tascam’s digital Portastudio technology. 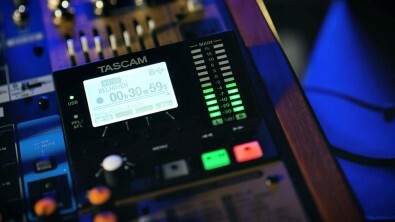 Mixdown, said Tascam, is to a built-in 22-channel mixer with 100 mm long-throw faders. The two monitor returns, subgroup bus and stereo main bus also are equipped with dedicated 100 mm faders. The Model 24 offers 12 mono channels, each with XLR mic and ¼-inch line inputs. Quarter-inch channel inputs one and two can be switched between line and instrument level. The unit includes four stereo channels with mono XLR mic and left and right ¼-inch line inputs. All 16 microphone inputs use a preamp gain control and an overload (clip) indicator for the channel's microphone preamp. Each of the first 20 channels includes Mute and PFL solo. An additional stereo channel (21/22) is equipped with unbalanced RCA, unbalanced stereo minijack and wireless Bluetooth connectivity and offers mute and pairing buttons. This enables streaming audio from a laptop or mobile device. Stereo channel 21/22 has also been optimized to feed the Monitor 1 and Monitor 2 buses via rotary auxiliary send controls. A Routing Mode selector enables each channel to be independently set to accept live input, the return from the USB bus or the return from the SD Card recorder. This enables users to overdub in the studio and to fly in backing tracks for live performance. Multi-segment LED meters monitor the stereo main bus output levels. Outputs include stereo XLR and ¼-inch main outputs, two ¼-inch monitor sends, an effects send, stereo control room outputs and a stereo ¼-inch headphone monitor output. The Model 24 provides signal processing. Each of the 12 mono channels include a one-knob compressor, a low cut filter and three-band semi-parametric EQ with sweepable midrange. The compressor and low cut filter are pre-routing mode selector so they can be applied to any recording track. The stereo channels include a low-cut filter and three-band fixed EQ. A stereo seven-band graphic EQ with toggle buttons and instant bypass can be applied to the main mix or monitor outputs. An onboard stereo multi-effects processor allows users to apply 16 preset effects, including reverb, delay, chorus and flanging. The Model 24 is expected to be available in the fourth quarter of 2018. The unit weighs 27.5 pounds. Price is $999.99.